When visitors first enter the Yud Gallery in the Contempory Jewish Museum, they hear a first voice asking, "Can we talk?" 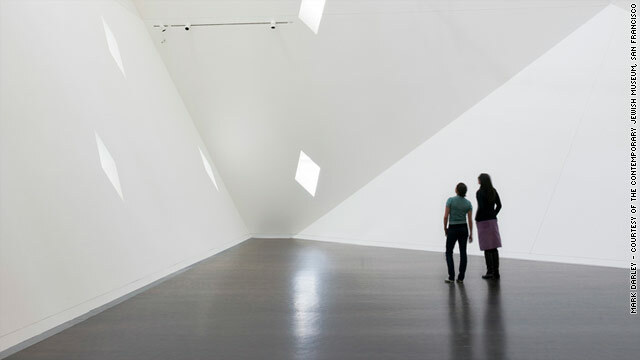 San Francisco (CNN) -- A new exhibit at the Contemporary Jewish Museum in San Francisco doesn't just challenge visitors. It questions them. "Are We There Yet?" is made up of hundreds of questions, and anyone entering the near-empty gallery hears a different combination from everyone else. The exhibit is actually responding to how fast each visitor moves around the room, how long he or she stays and where each person goes. "You are creating the experience," said Ken Goldberg, who worked with his longtime friend and collaborator, Gil Gershoni, on the show. He contrasts their sound installation to others, which he says are more like concerts. "Rather than being a preprogrammed performance, it's changing all the time." "You are part of the show, " says Gershoni, who is the founder and creative director of Gershoni Creative Agency, a public relations firm. "You really are able to get this immersive poetry as you walk through it, which is pretty moving." Cameras track each visitor, then a computer uses statistical models to understand who is where, where they've been and where they're heading. It's similar technology to the artificial intelligence behind Google's driverless car. "The system is learning the nature of the room, the texture of the room, the lighting at all times," says Goldberg, who, in his day job, is a professor of engineering at the University of California at Berkeley. It's not so simple, and the computer knows it, Goldberg said. "Rather than saying true or false, it (gives) confidence values." This would be familiar to anyone who watched the IBM computer named Watson compete against human contestants on Jeopardy. On top of answering questions, it displayed how sure it was of each answer. This computer is always evaluating how sure it is of each person's location. Someone standing in the middle of the nearly empty room might hear a cacophony from the combined sound of the questions playing to other people. On the edges, near the speakers, it feels intimate. The voices asking the questions are men and women of all ages, including both artists' children. A little girl asks, "What does love look like?" An older man says, "Where are you going?" And, from a woman, "What is history but a fable, agreed upon?" The artists say it's a lucky coincidence that the exhibit opened just before the Jewish holiday of Passover, which is all about asking questions and telling stories. But the primary Passover question -- "Why is this night different from all other nights? -- is sprinkled in among other questions from the Bible and Jewish thought, from pop culture, literature, and from the public. Anyone can submit a question for the show through Facebook, Twitter or the exhibit's website, are-we-there-yet.org. The questions range from the everyday to the profound. Goldberg says even a light question -- "What's up, doc? ", for instance -- becomes weighty given a different context. "You think of Bugs Bunny, but imagine someone waking up in the middle of the night with a phone call, and says, 'what's up doc?' It takes on a different meaning. And so we're very interested in that." Gershoni and Goldberg say the idea for an exhibit about questions bloomed out of their friendship. "They are a natural dialogue we already had going," Gershoni says. "You get two Jews in a room asking questions ..."
"There's the old classic joke," Goldberg interrupts. "A man goes to his rabbi and asks, 'Why do Jews always answer a question with a question?' And the rabbi responds, 'Do we?' "